This beautiful island off the coast of Oahu, Hawaii, is a tropical paradise. 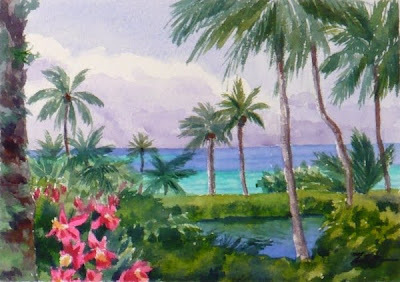 Here is a view of the ocean from a grove of palm trees. Tropical flowers bloom in the foreground. The coral reefs tint the water a lovely pale blue-green near the shore.